One of my favourite childhood memories is being with the whole family sat around the dining room table for dinner. It was a time for discussion and laughter and delicious food. 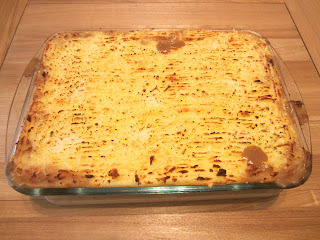 One of the dishes that always stands out for me was the traditional cottage pie. Now, every time I have a cottage pie I close my eyes and immediately slip back to those fond memories. The richness of the gravy, the textures of the beef mince and the chopped vegetables, the cream mash potato and the oh so special crispy cheesy top. Even sat here writing this post is making my mouth water. Although this website has been set up to share my travel stories and photographs, it is also an opportunity for me to share some of my favourite recipes. Some from my childhood and some from my travels. I hope you enjoy this one. By the way depending on your portion sizes, this recipe will either serve 8 big appetites or 10 average appetites. Step 1. Heat 1 tbsp oil in a large saucepan and fry the mince until browned - you will need to do this in batches to ensure that there is enough surface area in the pan for all of the beef mince to colour and not boil. Once done. set aside. Step 2. 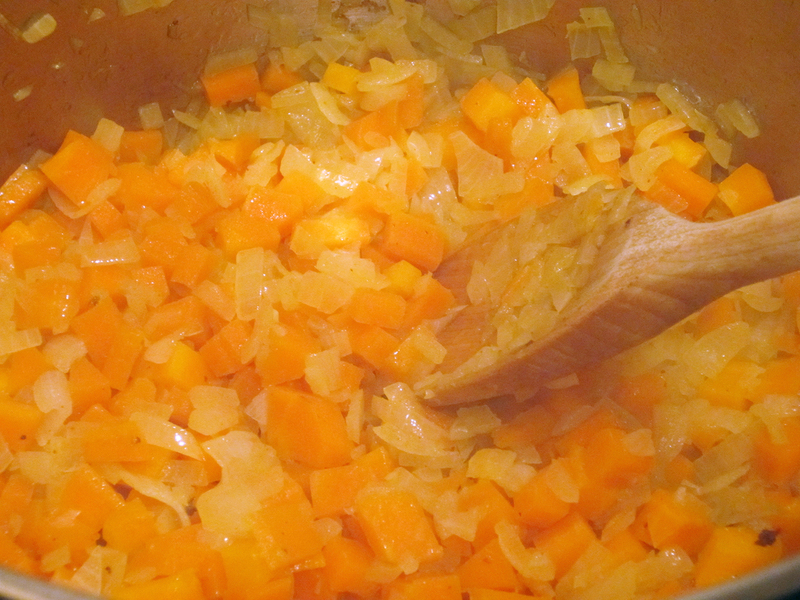 Put the rest of the oil into the pan, add the carrots and onions and cook on a gentle heat until soft, about 20 mins. Step 3. Add the garlic, flour and tomato purée. 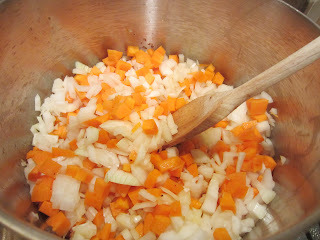 Mix in well with the carrots and onions to ensure that all the flour is incorporated. Then increase the heat and cook for a few mins,. Don't worry if you find any onion or carrot sticking to the bottom at this point, as this will all come off once the stock has been added. Step 4. Return the beef to the pan. (Pour over the wine/beer/ale, if using, and boil to reduce it slightly to cook of the alcohol). It is not necessary to add any seasoning at this point, as this will be done after the stock has been added and cooked in. Step 6. 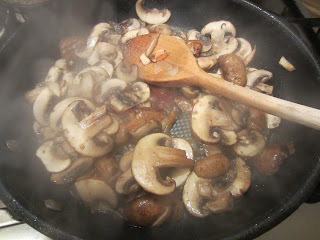 Add the stock, Worcestershire sauce, herbs and softened mushrooms to the main pan. Step 7. Bring to a simmer and cook, uncovered, for 45 mins. By this time the gravy should be thick and coating the meat. Check after about 30 mins - if a lot of liquid remains, increase the heat slightly to reduce the gravy a little. Season well, then discard the bay leaves and thyme stalks. Spoon the meet and gravy into one or two ovenproof dishes (depending on the size of the dishes). Ideally the cottage pie meat and gravy should fill about two thirds of the way up the dish, allowing the final third for the mashed potato. 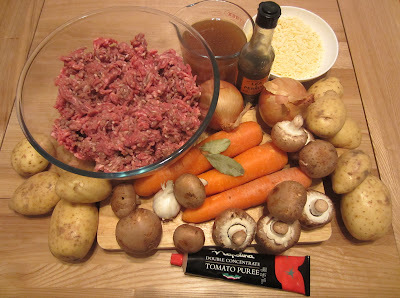 Allow the beef mince and gravy to cool off (for an hour or so, or even better overnight to allow the flavours to fully infuse). Step 8. Make the mash. In a large saucepan, cover the potatoes in salted cold water, bring to the boil and simmer until tender. Drain well, then allow to steam-dry for a few mins. 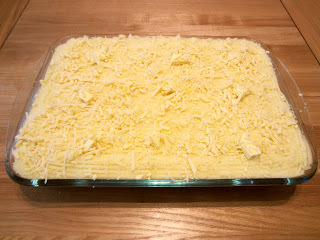 Mash well with the milk, butter, and three-quarters of the cheese, then season with some salt and pepper. For a really creamy and light mash, use a ricer or a sieve. Step 9. 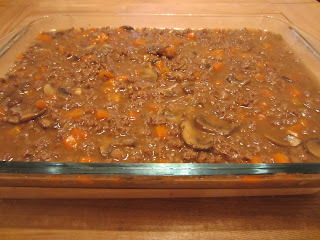 Pipe or spoon on the mash to cover the beef and gravy (run a fork over the top of the mash to give a rough finish. This helps give a crispy top to the cottage pie once it has cooked). Step 11. If eating straight away, heat oven to 220C/200C fan/gas 7 and cook for 25-30 mins, or until the topping is golden. Or follow the steps (below) to freeze. 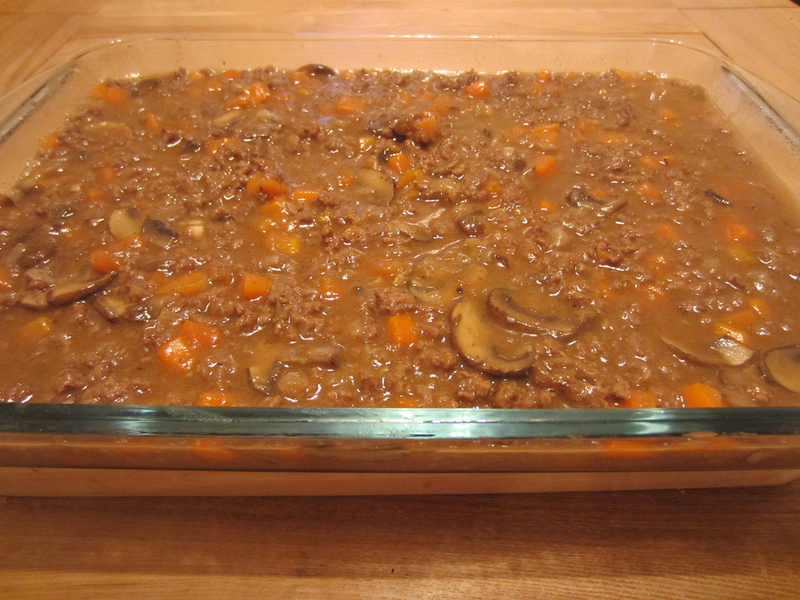 How To Freeze A Cottage Pie. Make sure the pie is completely cold, then cover it well with cling film and freeze. Always freeze the pie on the day that you finish making the pie. Defrost in the fridge overnight, then cook as per the recipe. Alternatively, to cook from frozen, heat oven to 180C/160C fan/gas 4, cover with foil and cook for 1½ hrs. Increase oven to 220C/200C fan/gas 7, uncover and cook for 20 mins more, until golden and bubbling. Finely chopped celery can be added to the meat at the same time as the onion and carrot – this improves flavour. Garden peas can be added to the meat mixture to add colour. Beer or Stout can be used with, or instead of, stock. A can of baked beans can be added for those who dislike tomatoes. Other diced root vegetables can be added to the meat mixture to increase to bulk and reduce the dish cost. Parsnips or turnips can be added to the mash to add a further flavour dimension. Stir in a tablespoon of horseradish or wholegrain mustard to the mash to further develop flavour. If tomatoes have been added to the meat, decorate the top of the pie with sliced tomatoes as well as cheese. 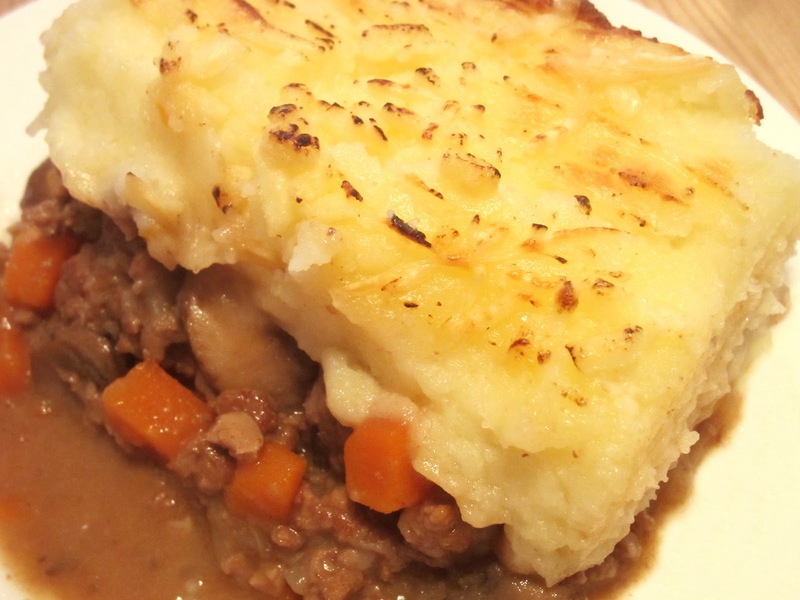 The History Of Cottage Pie. "In present day English, cottage pie is an increasingly popular synonym for shepherd's pie, a dish of minced meat with a topping of mashed potato. Its widening use is no doubt due in part to its pleasantly bucolic associations, in part to the virtual disappearance of mutton and lamb from such pies in favour of beef...But in fact, cottage pie is a much older term than shepherd's pie, which does not crop up until the 1870s; on 29 August 1791 we find that enthusiastic recorder of all his meals, the Reverend James Woodford, noting in his diary Dinner to day, Cottage-Pye and roast Beef' (it is not clear precisely what he meant by cottage pie, however)." 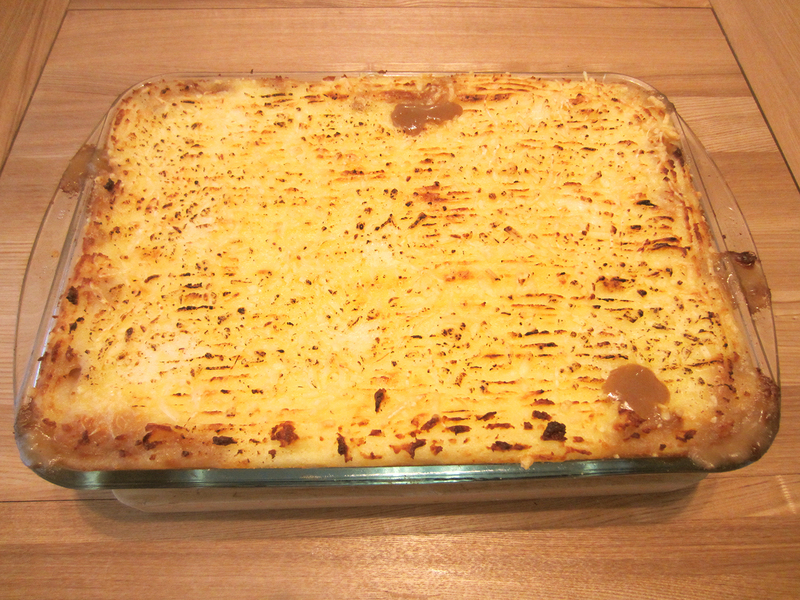 "The term cottage pie, often confused with shepherd's pie but probably denoting a similar dish made with minced beef, has a somewhat longer history and is similarly effective in evoking a rural and traditional context." This is also known commonly in New Zealand, as a potato top pie. In the United States a similar dish is called cowboy pie and in New England the most common recipe for shepherd's pie consists of ground beef, canned creamed corn, and mashed potatoes. A vegetarian version can be made using soya or other meat substitutes, or legumes such as lentils or chick peas. A similar British dish developed from this is Fishermans Pie made with fish and shellfish. In Argentina and Chile a similar dish is called pastel de papa (potato pie). Mince your mutton and your white together. When it is minced season it with pepper, cinnamon, ginger, cloves, mace, prunes, currants, dates and raisins, and hard eggs, boiled and chopped very small, and throw them on top." 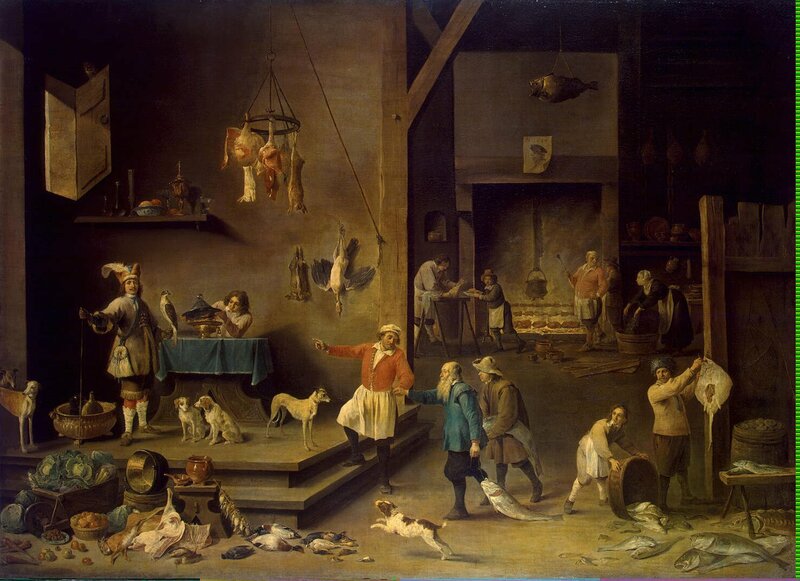 Take to a leg of mutton four pound of beef-suet, bone the leg and cut it raw into small pieces, as also the suet, mince them together very fine, and being minc't season it with two pound of currans, two pound of raisins, two pound of prunes, an ounce of caraway seed, an ounce of nutmegs, an ounce of pepper, an ounce of cloves, and mace, and six ounces of salt; stir up all together, fill the pies, and bake them as the former." 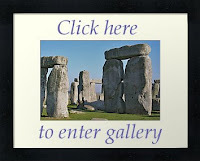 "To Make a very fine Sweet lamb or Veal Pye. Season your Lamb with Salt, Pepper, Cloves, Mace and Nutmeg, all beat fine, to your Palate. Cut your Lamb, or Veal, into little Pieces, make a good Puff-paste Crust, lay it into your Dish, then lay in your Meat, strew on it some stoned Raisins and Currans clean washed, and some Sugar; then lay on it some Forced-meat Balls made sweet, and in the Summer some Artichoke-bottoms boiled, and scalded Grapes in the Winter. Boil Spanish Potatoes cut in Pieces, candied Citron, candied Orange, and Lemon-peel, and three or four large Blades of Mace; put Butter on the Top, close up your Pye, and bake it. Have ready against it comes out of the Oven a Caudle [thick drink] made thus: Take a Pint of White Wine, and mix in the Yolks of three Eggs, stir it well together over the Fire, one way, all the time till it is thick; then take it off, stir in Sugar enough to sweeten it, and squeeze in the Juice of a Lemon; pour it hot into your Pye, and close it up again.Send it hot to table." ---The Art of Cookery Made Plain & Easy, Hannah Glasse [London:1747]Chapter VIII, "Of Pies." Butter a deep dish or mould, and line it with potatoes mashed with milk or butter, and seasoned with pepper and salt. Fill it with slices of the lean cold mutton, or lamb, seasoned also. Cover the whole with more mashed potatoes. Put it into an oven, and bake it till the meat is thoroughly warmed, and the potatoes brown. The carefully turn it out on a large dish; or you may, if more convenient, send it to table in the dish it was baked in." Required: a pound and a half of cooked potatoes, half a pound to three-quarters of cold meat, seasoning and gravy as below. Cost, about 9d. The potatoes must be nicely cooked and mashed while hot...The should be seasoned, and beaten until light with a wooden spoon. 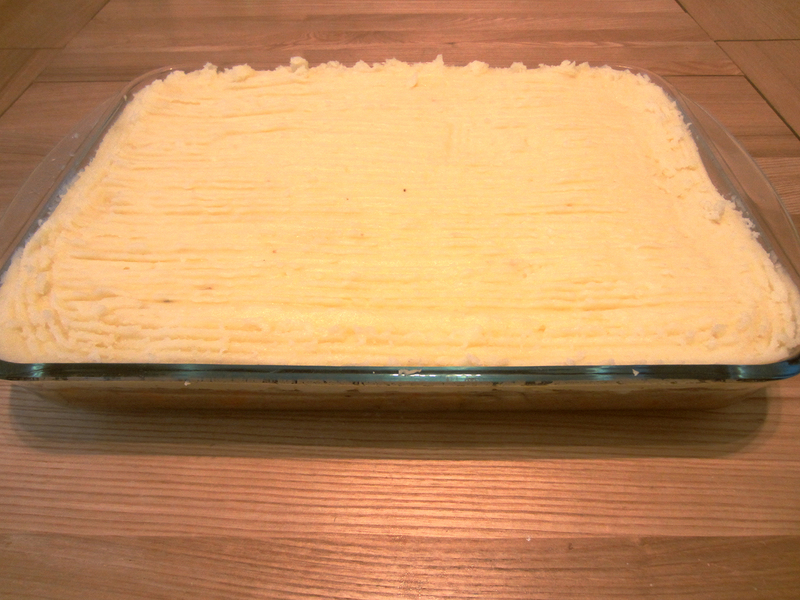 A pie dish should then be greased, and the potatoes put at the bottom, to form a layer from half to an inch in thickness. 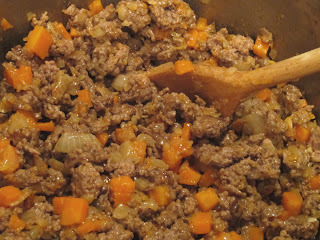 The meat should be made into a thick mince of the usual kind with stock or gravy...or it may be mixed with Onion Sauce, or any other which may be sent to table with meat. The nicer the mince, the nice, of course, will be the pie. 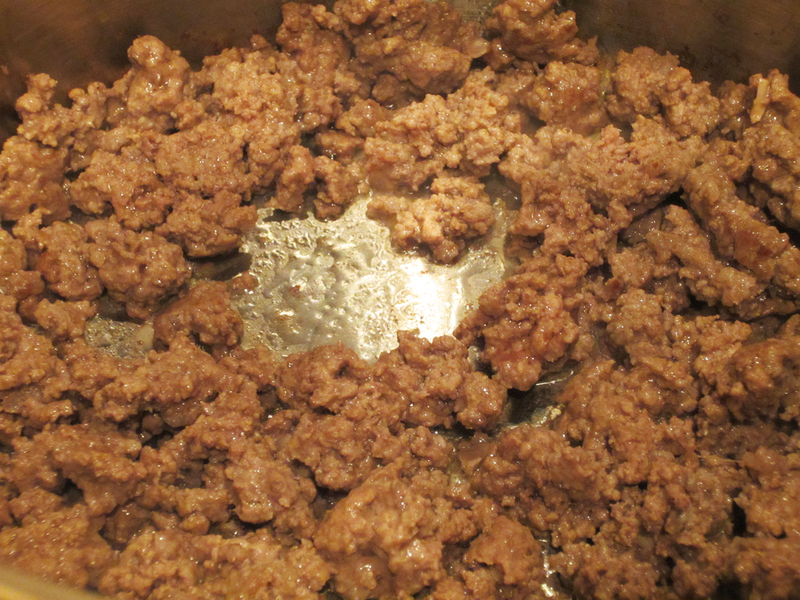 The meat goes next, and should be put in the centre of the bottom layer, leaving a little space all around. Then drop the remainder of the potatoes on the top, beginning at the sides--this prevents the boiling out of the gravy when the meat begins to cook--go on until all the used, making the pie highest in the middle. Take a fork, and rough the surface all over, because it will brown better than if left smooth. For a plain dish, bake it for fifteen to twenty minutes. Or it may be just sprinkled with melted dripping (a brush is used for this), or it may be coated with beaten egg, part of which may then be used in the mashed potatoes. As soon as the pie is hot through and brown, it should be served. There are many recipes for this pie, or variation of it, and in some, directions are given for putting the meat in the dish first, and all the potatoes on the top. The plan above detailed will be found the better, because the meat being enveloped entirely in potatoes runs no risk of becoming hard, as it wold do it exposed to the direct heat of the oven. Any other cooked vegetables may be added to the above, but they should be placed between the meat and potatoes, both top and bottom. 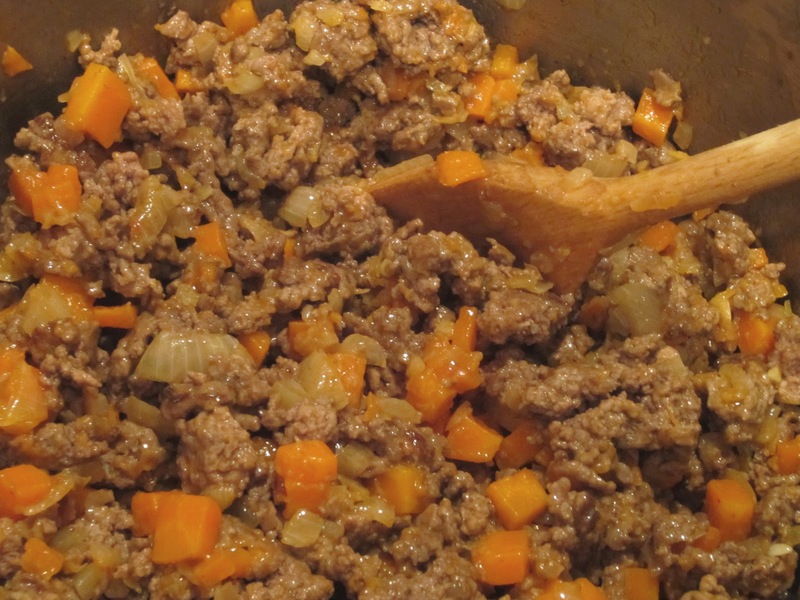 If a very savoury pie is desired, make the mince very moist, and allow longer time for baking. The potatoes will absorb some of the gravy, and found tasty. In this case, the heat must not be fierce at starting, only at the end for the pie to brown well. For a richer pie, allow a larger proportion of meat. For a very cheap one, half a pound of meat will do for two pounds of potatoes." Required: two pounds of meat, half-a-pint of canned tomatoes, half-a-pound of fried onions, salt and black pepper, and any herbs preferred, four pounds of potatoes, and some gravy. Cost, 1s. 6d. To 1s. 8d. First grease a deep baking dish with some of the melted fat from the tin. Boil or steam the potatoes, mash and season them ...and put them in an inch thick at the bottom and sides of the dish. Then put the onions all over the potato layer. 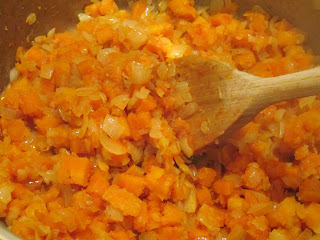 Mince the meat, add the jelly from it, and the tomatoes, with a little more stock or plain gravy of any sort; pile this in the centre of the dish; put the remainder of the potatoes thickly on the top; rough the surface with a fork, and bake until well browned in a moderate oven about three-quarters of an hour. The potatoes will absorb some of the gravy and be very savoury. The dish is an excellent one, considering its small cost. If liked, some pork can be added, and apple sauce used instead of the tomatoes. 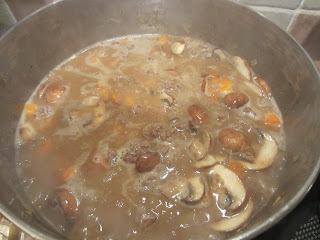 Tinned ox-tails, ox cheek, kidney, &c., may take the place of the beef or mutton. Either will provide a hot, cheap meal in a short time." I live in the States and we have a dish called Shepherd's Pie, but as your post states accurately, it is not the same dish (although quite similar). Your dish looks very delicious and I will have to try it soon!! 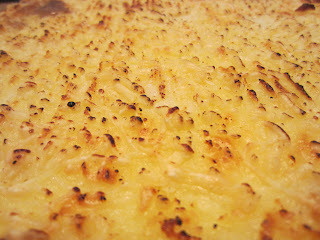 Never heard of Cottage Pie, what an interesting history behind it. PS: That chocolate yule log is making my mouth water. LOL CP, glad you like them. I have to confess that the Chocolate Yule Log was really scrumptious.